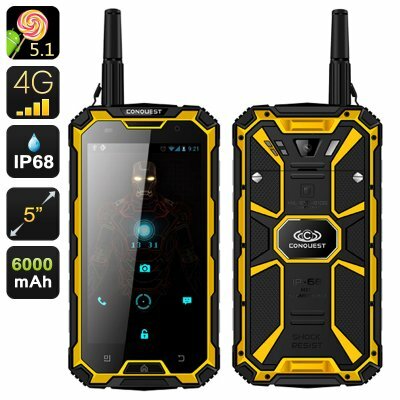 Successfully Added Conquest S8 Pro Rugged Smartphone - IP68, 5 Inch Gorilla Glass 4 Screen, 4G, GPS, IR, Walkie Talkie, 13MP Camera (Yellow) to your Shopping Cart. Looking for a phone that can keep pace with all your outdoor adventure, communicate when your off the beaten track, guide you home and snap great video and photos along the way, well say hello to the Conquest S8 Pro, The last Rugged phone you will ever need to buy. Complaint with military standard MIL-STD-810, the conquest S8 Pro has been pushed through its paces like a young cadet and came out with flying colors thanks to its IP68 waterproof and dust proof rating along with a tough Corning Gorilla Glass 4 screen. This high level of protection lets the phone withstand harsh conditions, such as a submersion in water, rolling in the dirt and being thrown about. So no matter what you get up to or where you go the Corning S8 will have your back and you will never need to leave it behind. The Conquest S8 Pro is a master of the outdoors, not only can it stand up to harsh conditions but it can help you find your way. The GPS and Compass functions will keep you on the right track ensuring you don't get lost. On top of this the phone can give you altimeter readings, atmospheric pressure readings so you can predict the weather and it will let you know the temperature. Everything you need for keeping safe in the great outdoors. The UHF walkie talkie function keeps you connected to the world even if there is no cellular network. Using UHF 400 to 470MHz frequencies the Conquest S8 Pro lets you have a conversation with people as far as 5KM away. An invaluable tool when you’re off the beaten path and the perfect way to keep in touch with other members of your group when trekking, skiing or at the mall. Two micro SIM card slots each with 4G cellular connectivity will allow you access to the fasted cellular data communications. With speeds faster than a typical broadband connection you can stream HD movies and enjoy unparallel data speeds on the 4G networks. This phone even has a 13MP camera so you can take HD videos of your extreme adventures and upload them directly to the web without any delays. When is cold outside you don't even have to get your hands cold as this camera has its own dedicated button so you can keep your gloves on still get great pictures and movies. Powered by a MTK Quad Core CPU a Mali 720GPU and 2GB of RAM this phone offers a fantastic performance that lets you enjoy films, multitasking and great games seamlessly. The 5.1 OS offers a beautiful interface that is enhanced by some great apps and navigation controls for an intuitive user experience. With a built in 6000mAh battery you can enjoy all these features for longer and even charge other devices through the phones OTG port. With the conquest S8 Pro in your home you wont need several remote controls as it has a built in IR transmitter that will let you switch channels on the TV, turn on the Air con and even play your DVDs , this makes it the prefect companion in doors and out. What more could you need in a phone. The Conquest S8 Pro contender and comes with a 12 months warranty, brought to you by the leader in electronic devices as well as wholesale Rugged Phones..